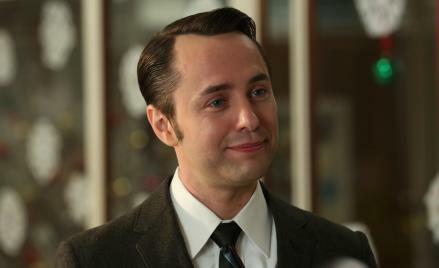 Mad Men The Doorway recap: Hair and beards in the season premiere. Pete’s sideburns, Peggy’s new do, Betty’s new color: The premiere in hair. With Seth admirably establishing the larger context, I will proceed immediately to the hair. It’s a topic of little interest in my daily life (barring the $20 I give a guy named Damian once a month), so I hope the many barbers in Slate’s audience will add color in the comments. For this episode was a steady tonsorial tease. You could hear the scissors snipping, snipping, ever louder. It built slowly. It’s not as if this is Friends and the title of the show was “The Premiere with the Hair.” Consider the open: After a few seconds of CPR, we cut to Megan’s bald and glistening navel, and we see the couple on vacation in Hawaii (as noted, Don [VO] recites Dante). CPR, a navel, and Dante is a lot of portent, even on the Mad Men portentousness scale, which starts above The Wire and stops right before Battlestar Galactica (remember that ding-ding Cylon warning-song?). Then, later, at dinner, a woman in an old-fashioned (even for 1968) beehive praises Megan’s soap-opera acting. Megan is on a soap opera! Bully for her. And Megan and Don are classic, beautiful, sculpted. Here in paradise they look like the future, and this woman with her decrepit hairdo worships—literally worships—at the altar of Megan and To Have and to Hold (the soap). * Only when we are back in the bitter cold of New York do we see that despite their beauty, their ruddy success, Don and Megan lack contemporary hair. The office—the office is bustling with bristles (and with client work—business is good). I found myself having to pause the episode and take in the faces. So many unusual mustaches or full beards. And there, suddenly, were Pete’s sideburns. It’s like he went to bed Charles Grodin and woke up Burt Reynolds. His side profile has become monumental, like that of a Civil War general after a tight shave. But Pete has little to do in the premiere, hopefully because they’re saving him up for lupus. Damning! But Betty is unbowed. She appears suddenly at home, in the kitchen, with a new cut—and a dye job. She’s gone dark. Her son hates the change and storms off. “Elizabeth Taylor,” says Henry, trying to please, “what have you done with my wife?” She has passed through an icy hell (Dante again, per Seth’s email) of shaggy misfits and emerged transformed. Roger Sterling (sideburns, but no big deal) is in therapy, and his mother dies, and while there was much fine acting from John Slattery, some bits were off. First, he throws a tantrum at his mother’s funeral? Really? I mean, what? It was just an odd bit of business. Oh, sure, his mother loved him and so on. But come now. And then, later, when he is delivered of the shoeshine kit of a dead shoeshine man, oh woe, and is finally … able … to … grieve, it was forced, annoying in the regular flow of this show. To see Roger sob in his office should have been a pleasure reserved for later in the season, when we’re all tired and need it. The only thing that would redeem the narrative hokery is if we find out that the shoeshine kit was sent as a cruel joke by another SCDP employee, perhaps Ken (who has become nasty and territorial about his corporate turf). There’s much to Don’s story, of course, and his fawning over a doctor while he schtups the doctor’s wife tells us that there could be some classic Don flailing this year, which is of course why we tune in. But the star of the premiere, the real focus for me, was the hair. Take away all the dialogue, sets, props, voices, and bodies. Leave only the beards, mustaches, and trims, moving through space and time. I posit that it would still be compelling viewing. Perhaps even more compelling. Such is the power of this show in our culture at this time. Mark me, peers, these are not mere beards. Hanna, what did you think?